How far does the difficulties/adversities have to push one before he or she gives up? I have two answers to that question. My first answer is, I don’t know because I’ve never given up before. While it’s true I’ve been at the point of no return but I’ve never crossed that imaginary “point of no return” line, in fact I am there right now patiently waiting for the LORD to rescue me, to pull me back, and I know He will. But then isn’t that where we all are to a lesser or greater degree if we are willing and have the courage to admit it??? As I was falling it wasn’t my entire life flashing before my eyes, it was just those times when circumstances and people robbed me of my hopes and dreams, trying to remold me into their image and not that of the Father’s. I don’t really know how long I was falling, but believe it or not it was years. I kept waiting and waiting for the sudden stop and thud when I hit bottom! 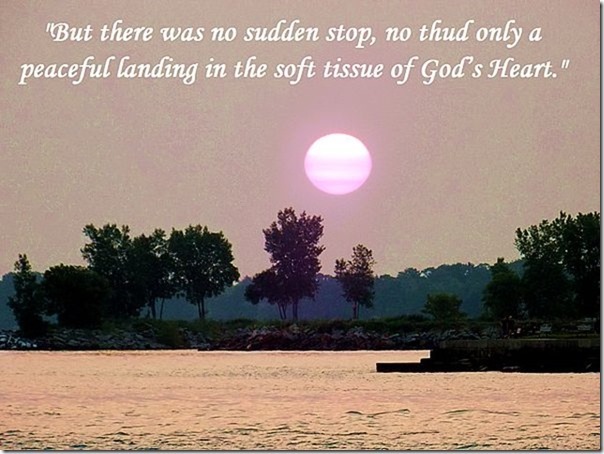 But there was no sudden stop, no thud only a peaceful landing in the soft tissue of God’s Heart. And as I lay there unable to speak because of the magnitude of the blessing I’d just received suddenly I was flooded with a Light beyond bright and I knew I’d never have to give up again. If you think for one minute this is my exclusive story you are wrong! Perhaps your imagination will not allow you to have your own experience but it is your story as well as it is mine. Here’s something to think about and to live out.